The most delicious and cutest cupcakes, cookies, cakes! 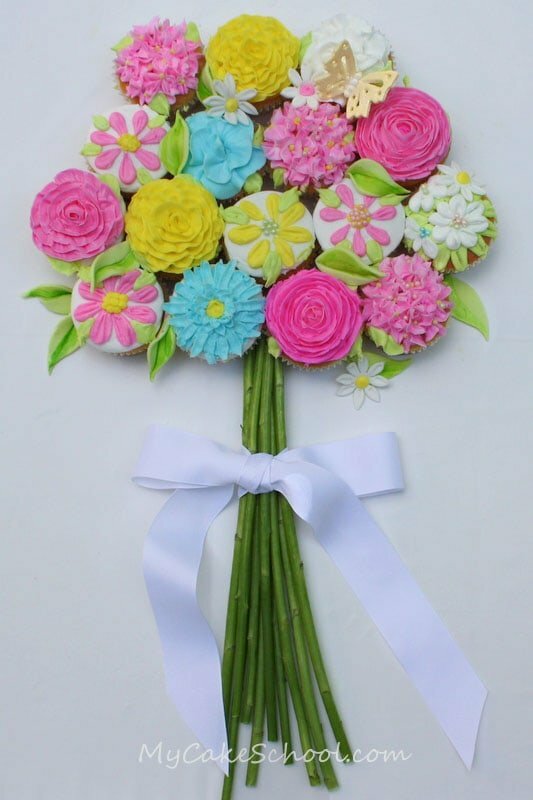 My Cake School did an awesome tutorial on how to make this gorgeous Cupcake Bouquet! The step-by-step tutorial shows you how to use various piping tips to make each of the flowers shown, plus shows takes you through the finishing steps to really make this bouquet come to life. Wouldn't this be just perfect for Mother's Day? 0 comments on "Cupcake Bouquet Tutorial Link"
Happy royal wedding anniversary, Will and Kate! Cake pops of the day: Class of 2012 celebration! Mountain Dew & Doritos Cupcake?! Giveaway: Cupcake Tee by DoughBoy! Sprinkles Ice Cream Opening May 24! Sock Monkey Cupcake Stand Winners! Giveaway: Cupcake Stands by Green Party Goods! Whoa, what at butterscotch cupcake!